Managing a business, from people to products to process, is an enormous effort that for successful business managers becomes a matter of lifestyle where your work life and home life become indistinguishable: the more successful you become the less you’ll be able to define hours during which you work and which you won’t. Just dedicate an hour, 30 minutes, 15 minutes every single day towards working on the problem. 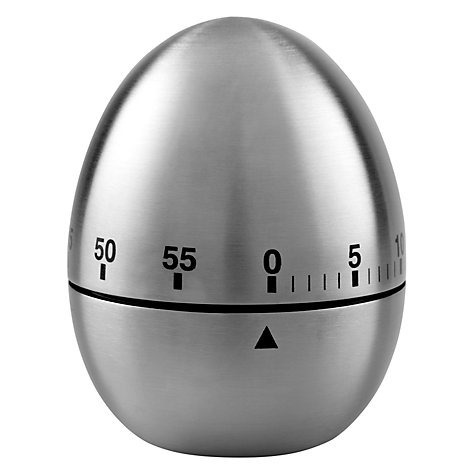 Here is an egg timer to keep you accountable to yourself. Bam. Think about the compound returns – an hour a day dedicated to marketing is equivalent to spending over 9 weeks working on it full time! And who can’t find a single hour a day that will absolutely guarantee you solve your marketing issues, launch a huge sales process, implement that new tool that will transform your business and then more! Everything in life and business that has been holding you back can be solved with this piece of advice and this egg timer. Don’t think of it as a cheap gimmick that mocks your inability to manage time and focus, think of it as an accountability supertool (note to self: Brand the said egg timer with my logo so I can give it away at my seminars) that will finally get you on track. Here is what unemployed people don’t know about real work: It’s hardly a linear progression of tasks, perfectly structured periods of uninterrupted time, with clear deliverables and agendas that always work out. We all deal with the exact opposite and those challenges lead to burnout, frustration, stress and a overwhelming feeling that we’re never going to get ahead. Congratulations. You’re just like the rest of us, like every single one of us. Quit your bitching and whining because that’s just the part of corporate work and here is the egg timer, throw it against the wall or smash it against the table, take a deep breath and a Diet Coke and get back to it because the pile is just getting bigger. But what about stress? What about things I could do every day to move my business forward? Do work. 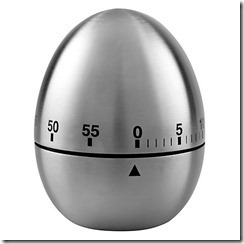 When you feel stressed out about it close your eyes for a second, take a deep breath and thank whichever deity you believe in that you don’t have to earn a living trying to sell people business optimization tricks that involve egg timers.